What’s better than a fantastic BBQ with one of the best chefs in London? 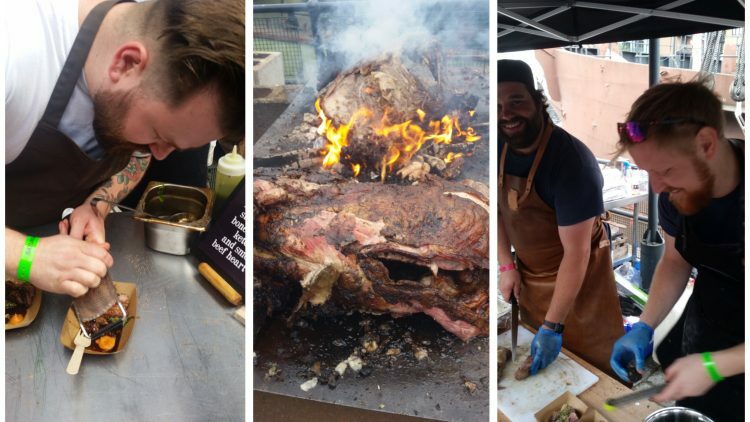 Twenty five BBQs with twenty five of the best chefs in London’s Meatopia!!! I can’t describe it better than their website. “Founded in the US by the late great Josh Ozersky and brought to the UK in 2015 by chef Richard H. Turner and London butchers, Turner & George, Meatopia is a festival of high-quality, ethically sourced meat, all cooked over ethically sourced wood and charcoal by some of the world’s leading chefs.” Jose Pizarro (Pizarro), Yotam Ottolenghi (Nopi), Tom Adams (Pitt Cue), Luke Findlay (Patty & Bun), Richard H Turner (Hawksmoor) and the god of all things smoked, David Carter (Smokestak) were just some of the chefs at this year’s event. Throw in some live music and the fantastic venue of Tobacco Docks and you’ve got a recipe for the best BBQ of your life! I’ve been lucky enough to get tickets both years and this has now become my favourite annual fixture. This is not an event for those just after bangers and burgers. Though you can get those, what really makes this event special is how all these chefs, without the benefit of any gizmos or gadgets, elevate the humble BBQ to an entirely different level. Combining creative techniques, ingredients, cuts and accompaniments, whilst still letting the key ingredients shine, is no small feat, but these guys are all doing it to an incredible level. Stand out dishes were David Carter, as always, with his amazing brisket with pickled red chilli and bone marrow butter; Tom Adam’s smoked Mangalitza kielbasa with sauerkraut was one of the best sausages I had this year; and the overall winner in my book was Tom Griffith’s slow cooked glazed short rib with pan stock dashi, bone marrow ketchup and smoked beef heart ash. Absolutely stunning! So if you’re in town and free for next year’s Meatopia, I couldn’t recommend it strongly enough. But be warned… if you don’t fancy having your clothes, hair, skin and eyes completely embalmed in smoke, this event might not be for you!